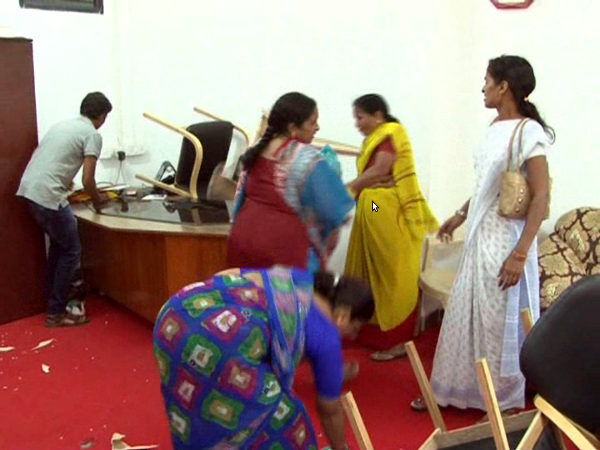 After attacking his room in the legislature home in Bangalore today it was the turn of the office of MLA Sambhaji Patil’s office in City Corporation premises. It was attacked by KRV activists and also included women. The police protecting his office were not able to avoid this incident in which they entered his office and destroyed the furniture in the office. It may be recalled that attack on the MLA has gained momentum after he spoke in Marathi in the Assembly and then also spoke bad about the govt in the Maha Melava it is alleged. This is democracy.. every people have right of freedom of speech. you can’t force others to speak in other language they don’t want to speak. people don’t have right to take law in their hands. also they don’t have any rights to hurt people and their sentiments. Is this what we call “DEMOCRACY”??? This act is the perfectly example of vandalism under POLICE protection. Didn’t knew Police dept is that helpless. SAD!!! I was under impression that LAW treat everybody EQUAL. Interesting why you are publishing what this hate monger said. He talked of doing a shava yatra of Karnataka! He should realize this is just the beginning, if he continues in the same tone, it will turn worse. MLA deserves this treatment.. He as provoked people of kannadigas and we ll not tolerate such comments made by him.. If he wants to spk marathi he wud hav contested elections under the EC of maha, not KTK, he will be shown his way out in Blore next time he visits , this is too much ,where is MES is Maha ,do the Maha people not want Ekikaran of Maha? This is India, which is a democratic country. Every individual has freedom of speech in any language. This is our fundamental right. If some anti national elements r going against this and hiding themself behind women and under the cover of police doing voilence. Thanks to those people for they have showed the way lto screw them.